So this is the tenth and last in a sermon series Jo and Katie and I have been preaching this fall to commemorate the 500th anniversary of the Protestant Reformation and the 125th anniversary of Kenilworth Union Church. We’ve called the series Stained Glass for two reasons. First of all, thanks to Bill Hodgson, Senior Pastor here from 1944 till 1970, we have all these denominational windows on the west wall of the nave, representing the various traditions from which most of our members arrive here at Kenilworth Union. And secondly, Stained Glass is the perfect image for American Christianity, because it’s a mosaic; it is made up of many little pieces, and if even one piece were missing, it would be incomplete. Each of the great Christian traditions contributes something unique and irreplaceable to the Church catholic. So far in this sermon series we have looked at Presbyterians, Congregationalists, Episcopalians, Catholics, Lutherans, Methodists, and multi-denominationalists like ourselves. Do you know which of those great traditions is the largest and most numerous in the land? The correct answer is ‘None.’ None of them are. The largest religious grouping in the United States in 2017 is Nones—N-O-N-E-S.
That is to say, when surveys ask Americans what denomination they belong to, the commonest answer, for the first time ever in 2017, is None. No denomination. No church membership; 107 million Americans, or 33% of us, call ourselves Protestants; 110 million Americans, 34%, call themselves Nones. There are 50,000 nuns in the U.S. Nones outnumber nuns—2,200 times. Why is ‘nothing’ such a popular religious choice? Why are so many Americans fleeing church like Bears fans from Soldier Field in the fourth quarter of a blowout? The simplest and most prosaic answer is that millennials are just not joiners. The older you are, the more likely you are to be a member of a church; the younger you are, the less likely. Twenty-somethings simply don’t go to church. As year succeeds to year, fewer and fewer of them will ever join a church, even when they get married and have babies that need baptism and Sunday School. My guess is that most of them are not faithless. I would guess that if you asked Americans if they believed in God, 90% would answer ‘yes.’ They just aren’t joiners. That’s the simplest answer, but that’s boring. Let’s investigate two more theologically interesting answers to why so many Americans eschew organized religion. I’ve been saying that each of the traditions immortalized in our stained-glass windows has a contribution to make to the Church catholic. Is that true of the Nones? What do the faithless, or at least the churchless, bring to the potluck supper that is worldwide Christendom? Perhaps their chief contribution to Christianity is to remind Christians how hard it is to believe the teachings of the Church. Ever since I cooked up the idea for this sermon series this summer, I’ve been wondering which of our windows exemplifies the Nones, and then it occurred to me that these World War I windows were just right for the purpose, because it was just the poison gas and trench warfare and random brutality of World War I that made it so hard for many people in Europe and America in 1918 to believe in a good God, right? In 1914 the world is so hopeful and optimistic, scientific and industrial progress all around. Four years later, most of Europe lay in ruins. It destroyed the faith of many. 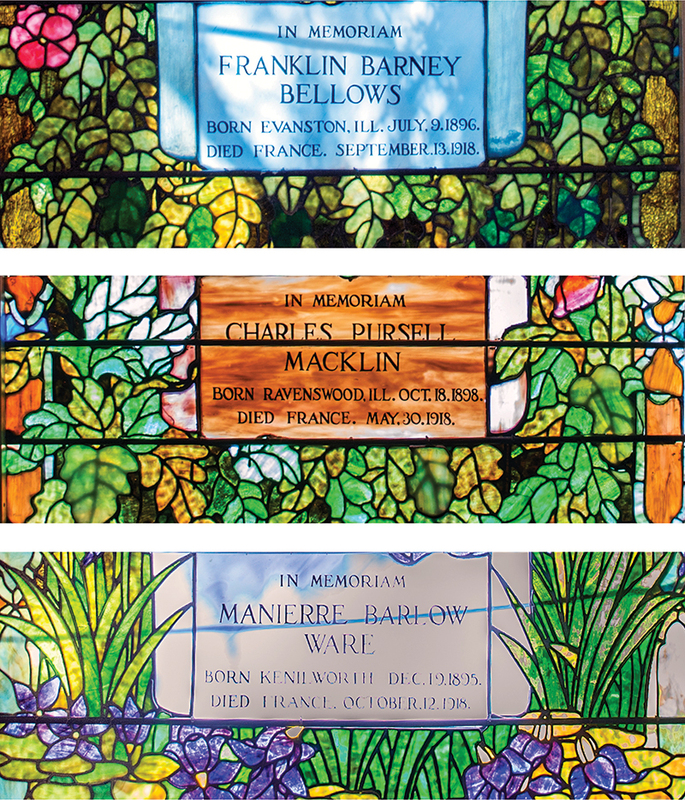 The bottom window remembers Manierre Barlow Ware, New Trier High School Class of 1913, University of Illinois Class of 1917, who died in France on October 12, 1918. When was Armistice Day, the cessation of hostilities? November 11, 1918. Lieutenant Ware was 30 days from peace and home. But now he lies forever in the Meuse-Argonne Cemetery in France. For many Europeans and Americans, World War I just extinguished their faith. So maybe the contribution of the Nones to the mosaic of Christian faith is the reminder about how hard Christian faith really is. Maybe the Nones can jolt the churched out of their complacency. You see, here’s the thing: for most of the 5,000 years of recorded human history, God-fearers were always surrounded by other God-fearers. In Europe and America, until about 200 years ago, maybe starting with the American and French Revolutions near the end of the eighteenth century, there was no such thing as an atheist, not a public one anyway; perhaps a tiny minority harbored private doubts, but these skeptics stayed silent about those doubts because those doubts could get you killed. No such thing as a public European atheist until 200 years ago. What’s happened since? Well, here’s one thing that happened. Science fired God. There is less and less for God to do. God is unemployed. Copernicus and Kepler and Galileo removed earth from the center of the universe. Isaac Newton and James Clerk Maxwell explained the entire workings of the universe with a mere four elemental forces: gravity, electromagnetism, strong, and weak. In 1802, the French mathematician Pierre-Simon Laplace published a five-volume textbook called Celestial Mechanics which explained the workings of the universe: energy, matter, planets, stars, everything. Five volumes. And then on the brink of the American Civil War, this unassuming trust-fund baby and aficionado of beetles and barnacles in the English countryside publishes the Mother of All Ideas, taking away yet another of God’s previous duties, that of concocting the polychromatic, multifarious, cacophonous zoo of creation. By the way, they do a great job of teaching Darwin in our local public schools. When Katie tries to tell our confirmands that “in the beginning God created the heavens and the earth,” they push back hard with their Darwin. Richard Dawkins recently retired from his chair at Oxford University. He says that anybody who believes in God after Darwin is an idiot. I think that is a direct quote. An idiot. Ouch. Plunge the knife in and give it a twist. Dr. Dawkins says that faith is like smallpox, but harder to eradicate. Dr. Dawkins’ fellow unbeliever Sam Harris is horrified to learn that 120 million Americans believe that God created the world 2,500 years after the Babylonians learned to brew beer. So maybe there are so many Nones because of the spectacular success science has had in explaining the world without the God Hypothesis. Or maybe it’s not so much the success of science as the failure of religious people themselves. Christopher Hitchens points out that most suicide bombers are passionate believers. Most genital mutilators are God-fearers. Many child abusers are Roman Catholic priests. The Bishops who shuffled those abusive priests around from parish to parish for decades were people of deep, deep Christian faith. The popes who forbid condoms in the age of AIDS, and deny any contraception in an overpopulated world, are people of faith. Mr. Hitchens points out that the only Nazi ever excommunicated from the Roman Catholic Church was Joseph Goebbels, and he was invited to leave the communion not for engineering the holocaust, but for marrying a divorced Protestant. So maybe the Nones are Nones because they’re thinking like John Lennon. So the Nones are not the enemies to those of us who have been able to make the Christian God our own. They are our worthy antagonists. In two ways, they are the loyal opposition. First, they help us sharpen our thinking about the noble but empirically unverifiable hypothesis of God’s existence. And secondly, they help point out the ways we people of faith are falling far short of the lofty, honorable ideals the Invisible Deity and the very Visible Son have asked us to reach up to. Did you know that there is a splendid story in the Bible just for Nones, just for people who have not been able to make the Christian God their own? I don’t have time to explain what Paul is doing in Athens when this story happens, but it’s almost as if he’s there as a tourist. He’s sightseeing; he’s wandering the streets of the city seeing what there is to see, and he eventually finds himself up at the Areopagus near the Acropolis. Areopagus is Greek for “Mars’ Rock,” or “Mars’ Hill,” the Hill of the God of War. And Paul thinks this gives him a point of connection with these smart but pagan Athenians. With respect, and kindness, and the willingness to listen, he says to the Athenians, “This God You Do Not Know, we Christians know who that is. Let me tell you about this carpenter from Nazareth. Then you can make up your own minds about him.” Agnosto Theo: To an Unknown God. It’s where we get our word ‘agnostic’; someone who does not know about God one way or the other. We all know people who are better than their religion, right? We all know people who would be better off without their faith. An article in The Christian Century a while back had a provocative title: it was called “Church-Based Hate.” It told the story of Mary Lou Wallner, who was a woman of deep, rich faith, but her faith did not help her deal very well with her daughter who came out as a lesbian. She just could not accept this sexual orientation. Mary Lou’s daughter sent her a letter saying that Mary Lou was her mother only in a biological way and that her shaming words had hurt the daughter very much. The daughter said that she did not want to, and did not have to, forgive her. Mary Lou decided to respect her daughter’s wishes and gave her the space she was asking for. She stayed out of her daughter’s life. They lived far apart. And so, we ask people of unfaith or no faith to help us fashion a faith that will help us to live beautiful lives. We have been given this stunning story. The Maker of All the Stars and Worlds crossed vast spans of nothingness in the far reaches of intergalactic space to love us into loveliness and to grace us into gracefulness. Lavishly loved, we can lavishly love, and lavishly live. Christopher Hitchens, The Atheist Manifesto: A Declaration for Personal Liberty (Bowker Publishing, 2016), 5-6. Bertrand Russell, Why I Am Not a Christian (New York: Touchstone, originally published 1957), p. 19. David Gushee, “Church-Based Hate,” The Christian Century, June 2, 2009, p. 29.